Rustic piece of Swedish pine furniture, circa 1860. 2 part kitchen cupboard still in its original paint. 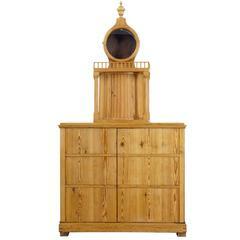 Top section with shaped cornice and double door cupboard containing 2 fixed shelves. Further storage for jars below the top cupboard. Bottom cupboard opens to 1 fixed shelf. Doors will need to have latches fitted to keep them closed if desired. Obvious losses to paint and marks to woodwork.